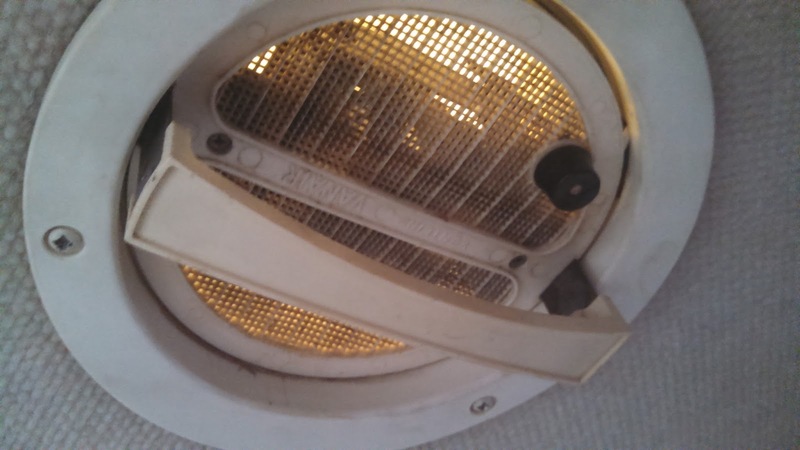 WanderMan: Have A Dead Round Bathroom Vent Fan? Can't Find One? Noisy? Replace It With Better! Have A Dead Round Bathroom Vent Fan? Can't Find One? Noisy? Replace It With Better! Recently, on a trip (of course) I switched on my circular bathroom vent fan to exhaust moisture while (and after) I showered. A couple of sparks and it was all over. No fan. I had previously replaced this with one from another Aero Cruiser owner's rig. He had decided to put a 14" Fantastic Fan in. Wow, that was like having a bathroom in a wind tunnel, but I digress. His old fan worked for about a year. Then this happened. I did manage to find a direct replacement, but the newer model would have required me to remove the entire vent assembly from the roof and re-do all the seals. Since it isn't leaking, I really didn't want to do that. Besides, the round fan was always very noisy and an energy hog. I found a better and easier replacement. Our RVs run (mostly) on 12 Volt power. The ceiling and roof fans are no exception. My bathroom vent fan used about 2.2 amps while running and was crazy noisy. It had a 12 Volt DC motor and a flat plate with vanes attached to the spindle of the motor. It worked OK. It did wobble occasionally and would have to be straightened so it didn't hit the side of the vent cap and stop. There had to be a better way. A long while back I added a 12 Volt computer "muffin" fan to my fridge chimney to improve cooling. It worked great! Why couldn't I adapt that style fan to the circular vent. No reason at all! So, that's exactly what I did. First I removed the trim cover's three screws and removed the cover itself. Then two tiny screws holding the retract handle. Once that was done, I went up to the roof and pulled gently straight up to remove the vent fan cover. That exposed the top of the spinning section of the vent fan. I gently pried that off with a rocking motion. It came off the motor relatively easily. Don't force it, you may bend the mounting bracketry and we will be using that later to mount the new fan. Once it's off, remove the two even tinier screws holding the motor to the bracket. Support the motor when the screws are almost out. I didn't and dropped the motor onto my toilet seat...no damage, but it sure sounded scary from the roof, whew! Everything is now disassembled. Back down to the inside portion of the fan, I pulled the fuse for the fans and cut both the positive and negative wires. Now I had to mount the new fan. It's square, but the vent is round. Luckily, my 5" fan fit nicely inside the old bracket, tucked up out of the way of the cover. 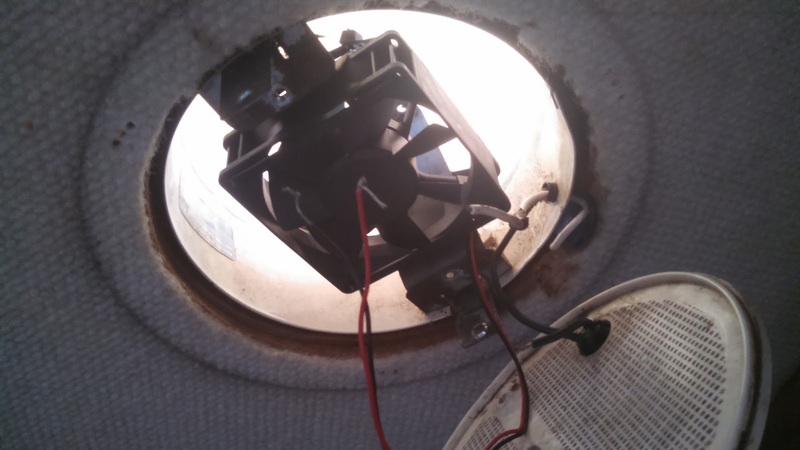 The fan had 4 mounting holes, one at each corner. They were perfect for some 11" black zip ties I had lying around. I threaded the zip ties down through one hole and up through the other on the same side. NOT Diagonally, that would have blocked the fan. Make sure you have most of the excess slack on the pointy side of the zip tie so it will be easy to tighten. I didn't and wasted a couple of zip ties before I figured that out. 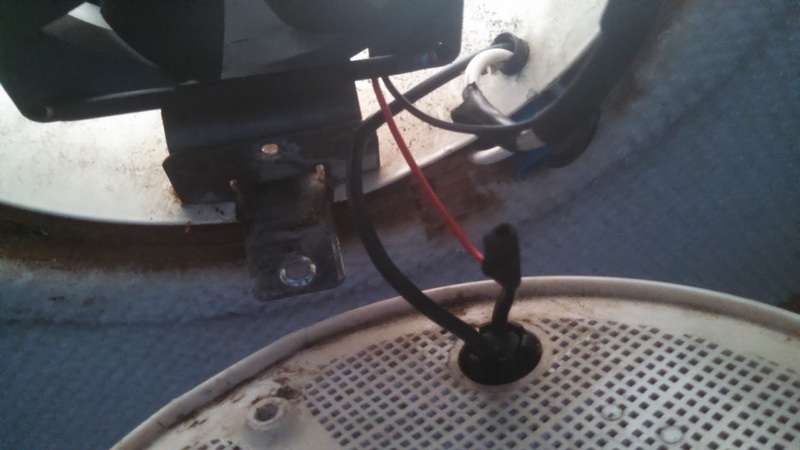 Back up to the roof, I threaded the zip ties so the fan was under the left/right bracket and the ties were on top. Now adjust the fan so it is horizontal and centered. Pull the zip ties tight. Now take a single zip tie and weave it under the first tightened zip tie, up and over the middle of the bracket and under the second tightened zip tie. Pull this one tight so it pulls on both of the first two and will keep everything from moving. Sounds complicated...it isn't! Once done, I wired the positive and negative to the fan. Be careful. I had the positive wire coming from the switch be a black wire instead of any other color. Usually, black is negative. Not this time, it was positive, and the negative was white! Then I slipped some heat shrink tubing over the connections, replaced the fuse and tested the fan. It's way quite and moves a reasonable amount of air. At that point shrink the tubing with some heat, tuck everything above the bracket and close up the vent fan assembly. Test again to make sure nothing disconnected. that's it...done! So far, it works great. MUCH quieter. I took a shower in there and it's about the same exhaust volume as the old one had, but since it only draws .15 amps/hour I can leave it running MUCH longer. The replacement vent fan assembly would have been over $100, and a pain to install. This fan was $4 and works great. The entire job took about 40 minutes. That makes me happy! Sounds like you're happy with the airflow in your smaller RV, but for larger rigs there ARE round brushless fans that fit better. My OEM fan was LOUD and moved way too little air. that's exactly where my next one is being installed! Stay Tuned. I kinda remember back a few decades ago when I worked for a computer company. It seems to me that those muffin fans made some really loud screaming noises & ran high rpm's, but I do believe they were 120VAC. I remember those! These are just 12 Volt and very quiet. 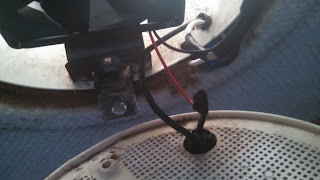 I believe the wiring mixup is due to the residential wiring of an rv. In your house the black is the live and white is common. In automotive wiring black is ground. No problem with moisture messing up the fan? Been using it all weekend, no issues at all.